We happened to visit Dubai almost by chance in December 2010. We were visiting India and had to change our tickets at the last minute due to a change in my schedule and the only tickets we could get required a 4-day halt in Dubai. We jumped on the chance to visit a new place! We have close friends in Dubai and had not traveled anywhere in almost two years. Tickets booked and all winds indicated getting a Dubai visa was easy – or so we thought.They had issued a new law that Canadians would require a visa to enter the country but did not have the systems in place to issue a visa so I could not apply at the embassy or online (via the Emirates website). After a lot of tries, we finally were able to get a visa by booking a reservation at the Sheraton and the hotel issued a visa to us. Our flight to Dubai was at 4:25 AM from Ahmedabad airport. We were on-time but as we went through the security checkpoint, the security fellows decided that the baby stroller was too large and made me run back to the Emirates counter to get it scanned. I understand this is for everyone’s safety and am always willing to comply with the rules, but I have to say the security folks were extremely rude and absolutely unprofessional. Our six month old daughter was sleeping in the stroller when they asked us to fold it. I asked them if we could just go through since she was a baby and waking her up would make her cry. He could politely have told me, its the rule, but shouted at me and said so what if the baby cries? Really? Once we woke the kid up (and needless to say, she was not happy), they simply refused to help my wife put the luggage in one corner while I went and got the stroller scanned – she was left managing a crying baby and six large suitcases! It is times like these when I really feel that my faith in the general goodness of humans is simply lost. A big thanks to another couple who was on our flight and helped my wife out. The flight was uneventful, good food and not-bad Emirates service. Rhea slept through the flight and we were happy for that. We landed in Dubai at 6 AM and immigration, while simple was a bit confusing. We had to go through two different lines (that were no where close to each other); one where the visa was stamped and the other where the passport was stamped. Dubai airport is alright: large, modern, clean and mostly efficient. They offered strollers for kids which was very useful for a family like ours. Our hotel had sent the car to pick us up and even though we had requested a large car, they sent a midsize SUV, which could not fit in all our bags. While trying to fit the bags in, we realized that we forgot the handbag that had our passports (all three), immigration papers and some jewelry in the free stroller! Here we were standing in the parking lot wondering what to do!I decided to run back and see if I could find the stroller and maybe the bag was still in there. As I approached the customs counter to re-enter the airport (from where passengers usually exit), the two Emirati agents who manned the counter did not seem to speak much English (and seemed bored – never a good sign). Whatever little they understood clearly meant I could not pass through. I decided to be brave (or foolish… mostly foolish) and told them I’m going in since I want to get my passport back and they could come with me and just started walking. Finally, one of them said OK and both of them followed me. Halfway through, they decided to take a detour and get coffee. I could not believe it! They just waved me through and I ran to the Emirates carousel where we think we left the stroller. The Emirates staff told me that they did indeed find the bag and it was in the lost and found section for Emirates Airlines (not the airport). Luckily the bag was there and it had all the papers and valuables intact! Very thankful to the helpful Emirates agents. Now, passports back in hand, what do you do about the bags that don’t fit. We decided that Heena and Rhea would go in the car and I’d take a cab to the hotel. The drive was not bad and we drove mostly along Sheikh Zayed road which is lined with impressive skyscrapers on both sides. I chatted with the Cabbie, a Pakistani fellow from Multan on his views on the pros and cons of living in Dubai (vs. Pakistan) as a taxi-driver. Our hotel, the Sheraton Jumeirah Beach was not bad, but like many Sheratons, slightly old and it showed. We had excellent views from our room, however. The staff was extremely courteous and helpful. Our room was not ready, so we had to wait in the lobby for about 45 minutes. Heena was hungry so I got a vegetarian sandwich and cappucino from the restaurant in the hotel. It was tad pricy (Paid about 64 DHS). Once settled in the room, the three of us were so tired and that we simply crashed. At about 1 PM our friends, V&J who we were supposed to stay with before the visa fiasco, called us. We were really excited to see them but also were so exhausted from the lack of sleep and the passport incident in the morning. Regardless, once we met them, we were so happy. I was seeing their son for the first time since his birht and he was all of seven years old now! Time flies. We have so many fond memories with them from our time in Bombay. 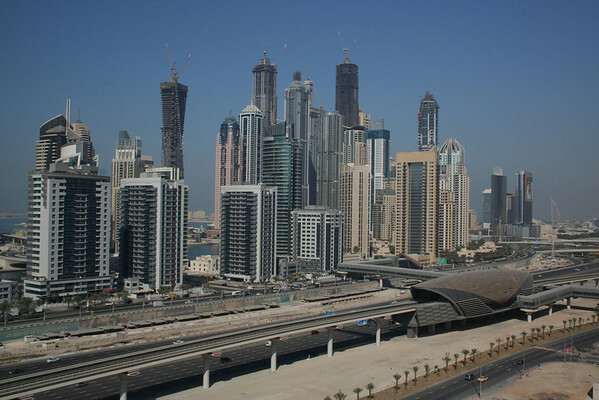 We drove over to their condo at the Jumeirah Lake Towers. I have to say, their condo has the most impressive city views! After a delicious meal at their place we simply hung out for a while. Lots to catch up on actually. In the evening we went out to Arz Lebanon and had a delicious meal of felafel, hummus and various mediterranian dips. After dinner we drove around dubai and drove by the Jumehriah hotel, Burj al-Arab and also onto Palm Jumeirah – the manmade islands! We wanted to drive by and visit the Atlantis hotel, but Heena was exhausted and feeling carsick so we turned around and head back to the hotel. Heena and Rhea was tired and simply went to sleep, while I went down to the cafe to catch up on work and homework. We woke up in the morning and got some breakfast from the breakfast buffet (benefits of being Sheraton Gold members!). The spread was clearly geared towards tourists who cared little for the local food; very little middle eastern food thrown in (the hummus sucked and all the middle eastern stuff was in the corner). The coffee was excellent. We got a window seat and the view of the sea was lovely. We were ready by 9:30 AM, which is right when Rhea decided to take a nap. At 11 AM, when she finally woke up and we took a 10-minute cab to V&J’s house. Heena decided to stay with V and chat since they had a lot to catch up on. 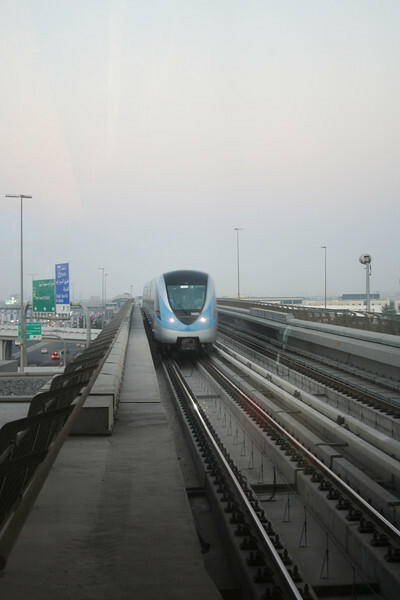 After lunch, I decided to visit the Mall of Emirates and also try out the Dubai Metro. If you know me, you’ll also know that I hate malls. Or shopping for that matter. So why then go to this mall? 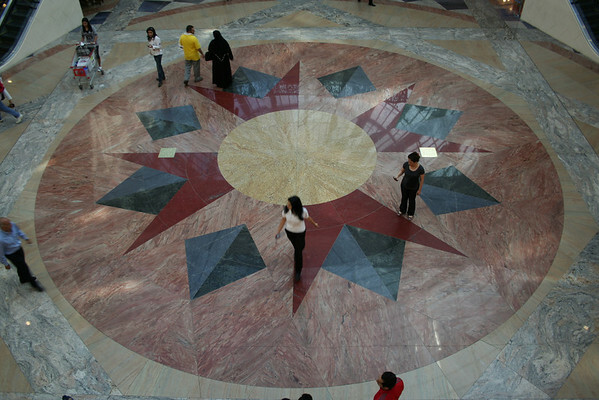 For one, it used to be the largest mall in Dubai (or the middle east!) 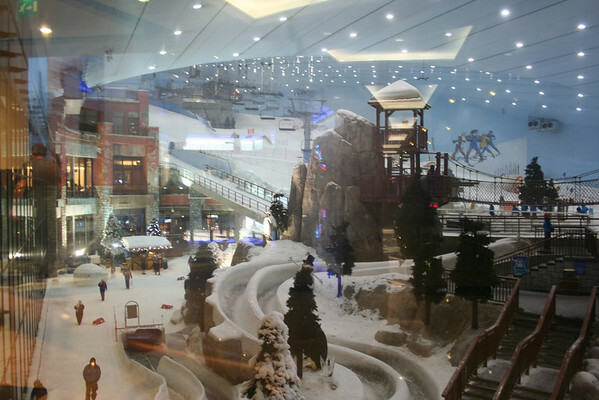 and secondly, it houses Ski Dubai. Now that was something you gotta see once! Besides, given the logistics and time, it seemed like that’s the most I could do. I am a big fan of public transit and the Dubai metro does not disappoint one bit! The trains were clean, on time and easy to use. You need a metro card which can be purchsed at the counter. Since V&J already had one I simply filled it with credit and was on my way! Dubai is positioning itself as a trade hub (which it already is) and now also as a tourist and shoppers paradise. All the advertisements along the metro made this very clear. 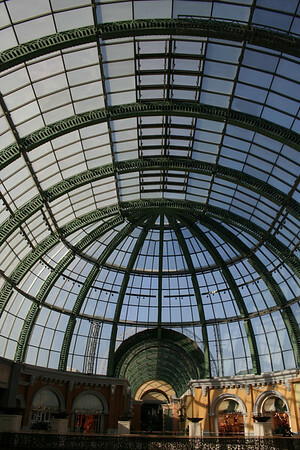 I liked the Mall of Emirates since it had all the stores that you expect to see in the US in addition to European ones. I did a lot of window shopping since I found it interesting to see “what else” is availabe around the world that we do not get in the US. 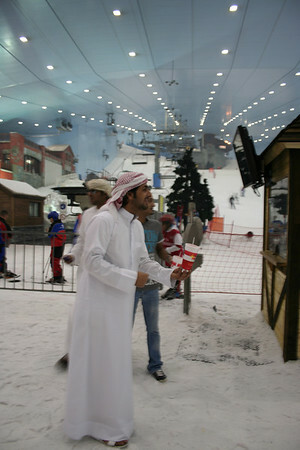 After walking through all of the mall, I finally hit Ski-Dubai. It cost me 120 DHS to go inside just to take a peek – I got a parkah and boots as a part of the ticket. There were not that many people and I could not help but wonder that the profits on this place had to be marginal, at best. However, I was visiting on what was a “Monday” in the middle-east so my judgment is skewed.I’m sure the place is teeming with people on weekends. After walking around for an other hour or so, I decided I’ve had enough and it was time to head back home, where V had cooked up a delicious south Indian meal! We spent the evening talking about various things and then they dropped us home at night. The third day, again, Heena decided to stay with V since Rhea had developed a diarreah. Heena and V also decided to take up the complimentary lunch voucher that the hotel offered us and just enjoy the hotel grounds. 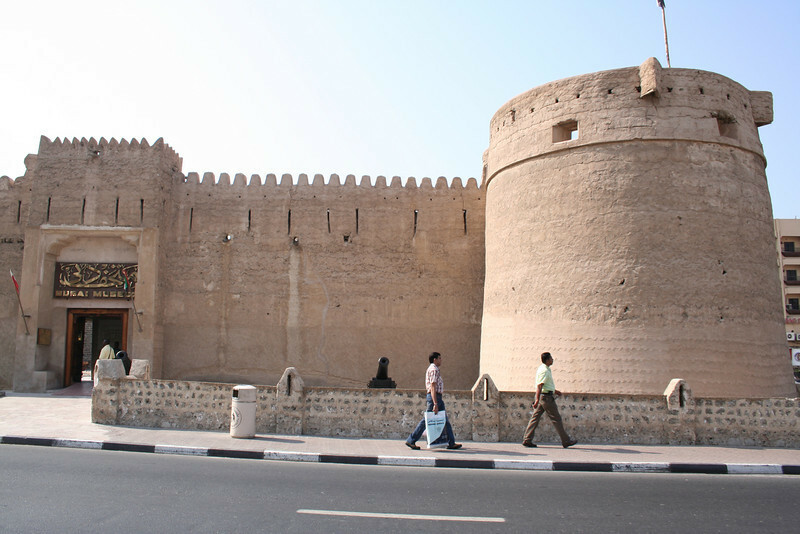 I decided to visit old Dubai: Bur Dubai, Bastakiya and Deira! I took a cab to the skytrain station and then the train to Al-Karama (which also happens to be the Indian district in Dubai). 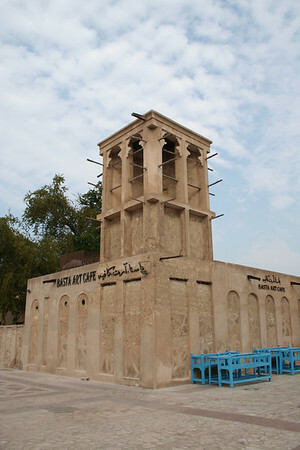 From there a short cab ride took me to Dubai museum which is housed in the Al-Fahidi fort (the oldest fort in Dubai). The museum gave an exellent insight into the history of dubai which was fascinating. They have complete replicas of different tradesmen workshops. I did not realize that Dubai was very active in the pearl trade and that’s where the trading status of Dubai started.They also had an excellent multi-media display on the history of Dubai. 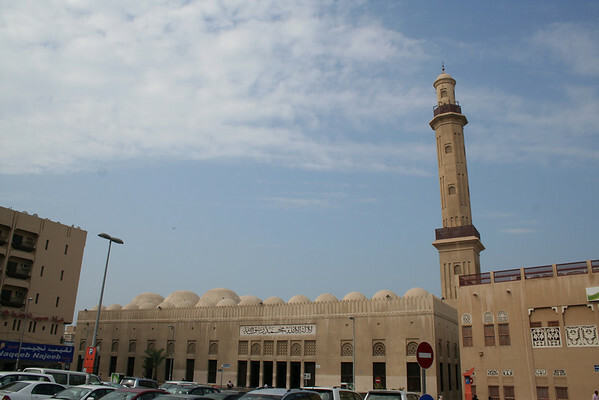 After the museum, I walked past the Grand Mosque which is UAE’s only multi-domed mosque. After walking around for a while, I reached Bastakiya – the oldest residential district in Dubai district which now houses art shops and small museums and most importantly, the famed wind-towers! I walked around Bastakiya for about 1-2 hours stopping in at various galleries and museums. The two museums I spent some time in were the museum of Numismatics and Museum of Philately. I was a bit surprised that the place was rather empty, but it could have been that I was visiting on a weekday and in the middle of the afternoon. As I exited Bastakiya, there was a ad-shoot going on for the city of Dubai to promote Dubai as a trade-center. 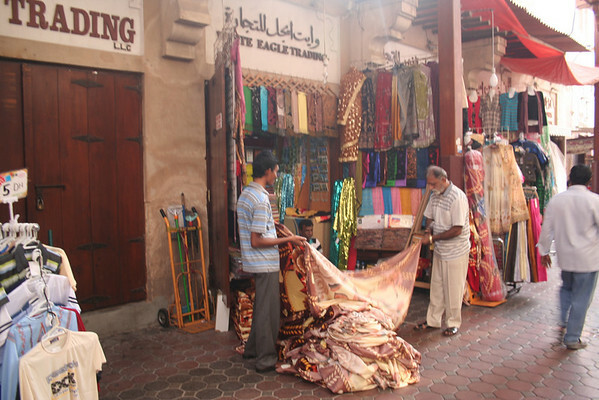 I walked along the waterway towards Bur Dubai and ended up in the textile souk. I was hoping to see some roaring trade, alas most of the shops were closed for the afternoon. I did find a corner in the souk where shops were open and sat watching the merchants conduct business. I have no training in textiles, but grew up around the textile trade and watching the merchants took me back in time and brought back a lot of childhood memories. I then walked along the promenade towards the Sheikh Saeed Al Makhtoum house which was the home of the former ruler of Dubai, and is now a city landmark. 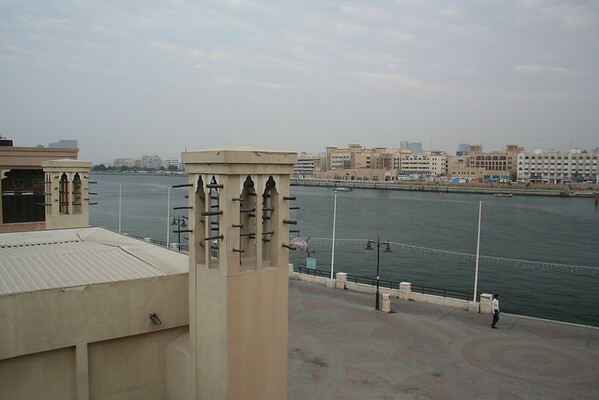 The promenade is lined with different restaurants and has benches where you can watch the barges enter Dubai creek and affords you views of Deira. While walking, a slightly older man called out to me and asked if I was from India. I said yes. He waved me over for a conversation. His name was Rehman and he was from Pakistan. 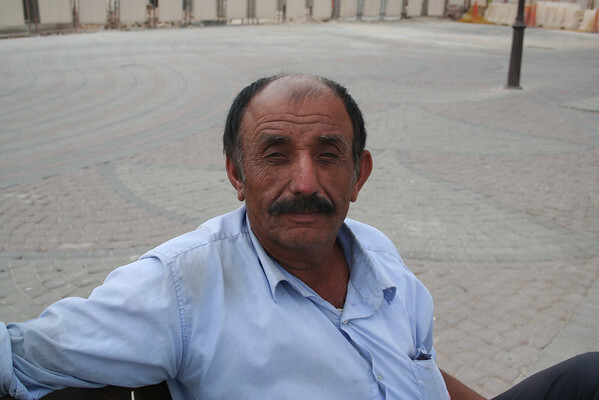 He had been living in Dubai for over 15 years and worked as a boatman. It was his day off and he was simply enjoying the weather and the view. He said that if I came back in time we should have tea together (When I was back, he was gone). Extremely affable fellow. The Sheikh Saeed Al Makhtoum house afforded lovely views of Bur Dubai and Deira and allowed me to view a few wind-towers up close. Each room had photographs and information about the life and times of its former occupant and so it was fascinating to walk through each room and soak in the history of not only Dubai’s rulers about the Emirate itself. I walked a bit further on the promenade I decided to turn back. There are many restaurants along the water and I picked one randomly, got a table by the water and ordered some hummus, pita, felafel and chai for a snack. The food was good and I watched barges enter and leave the creek. The restaurants were getting ready for the night and I realized I would have to come back here for dinner someday with the family! 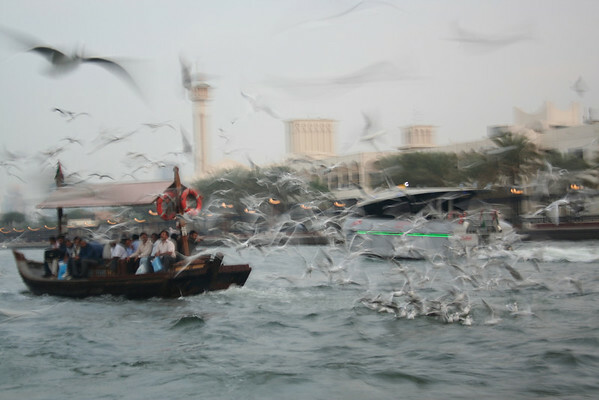 I then hopped on to a boat (too bad it was not a traditional dhow) to Deira. I walked around the spice souk for a while but was less than impressed. I guess I’ve seen better markets elsewhere in the middle-east or maybe I was visiting at a wrong time? There was neither the hustble-bustle of markets nor the vibrant colors. The gold souk definitely had more activity going and I walked through it as well. It was nearing 6 pm and I had to start heading back to meet the rest of the gang for dinner. 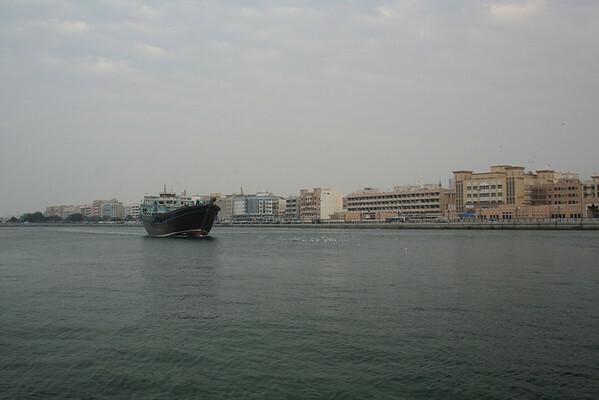 I took the boat back to Bur Dubai. I could not help but notice the birds that caught the wind and rode with the boat. 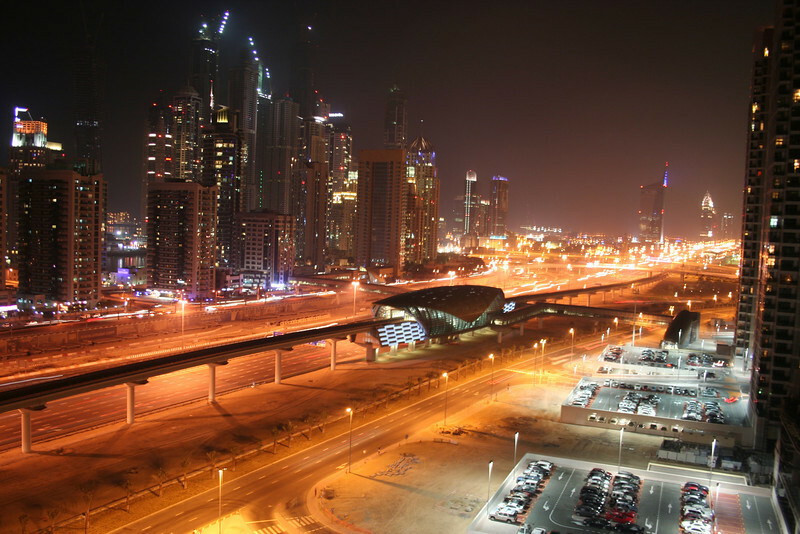 Once on the Bur Dubai side, I hailed a cab to the Al-Karama station and then took the train to Dubai Mall – the worlds largest mall (at least as of writing this. Larger malls are already in the works). This mall is HUGE. It also had a very cool toy store (Hamleys) and they had tons of remote control toys! As it turned out, I entered the mall on the wrong side and we were supposed to meet on the other side. I had to walk quite a bit to get to the other side. 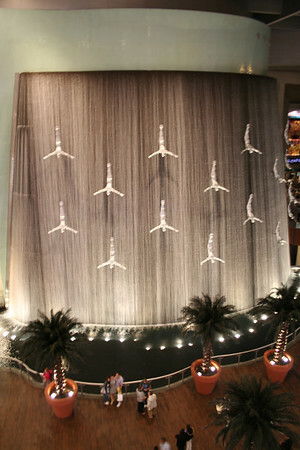 We waited for a while and saw the Dubai Mall fountain and it was truly an impressive show and way better than what we saw in Vegas. After visiting the Al-Fahidi fort, Bastakiya, Bur Dubai, Sheikh Saeed Al Makhtoum house and Deira, I realized there is more to Dubai than the stereotype of shopping mall Atlantis everyone says it is. After watching two shows we headed to Chopsticks in the Al-Karama district. It is an Indian Chinese restaurant and anyone who has eaten Indian Chinese knows how delicious the food is! The place did not disappoint. After bowls of fried rice, hot garlic balls and plates of veg crispy and american chopsuey, we were definitely full and decided to forgo a stroll and just headed home to crash! It was not that easy for me to go to sleep! I had homework to finish and the internet in the room was expensive (40 AED for internet is ridiculous). However the hotel offered free wifi in the lobby and I took my laptop down to finish up my homework. I worked for about 1-2 hours before I decided to call it a night as well. This was our last day in Dubai and we decided to spend it with our friends instead of trying to have an excursion with a six-month old who had diarrhea. Instead, we just took the train to the Ibn Batuta mall. At the mall we ended up doing some shopping at the Mother Care store (wish they had these in the US) and got some food at the food court (hummus, pita, dolmus, felafel – all excellent). We spent about 2-3 hours at the mall before returning to our home and spent the evening chatting away. Our flight the next morning was early and we started from the hotel at 5:30 am. At the airport, I tried to move the bags and strained by back. By the time we reached the check-in counter, I felt as if I need to head to emergency. The best thing they could advise was I go to a pharmacy shop, where I got some pain killers and A535 (that stuff is awesome!) – made the 16 hour flight bearable.The flight was not bad. Our fear was the Rhea will be uncomfortable but she was absolutely fine and played for most of the flight. Overall we liked Dubai despite the fact that we had visa problems, the airport mishap and the severe back-ache at the airport – things that would tend to leave a bad memory. We missed out on the dune-bashing excursion or visiting any of the other Emirates.Reason to go back!